A meal, in my eyes, isn’t quite complete without something sweet at the end. At home, in London, I tend to reserve my major indulgences for the weekend, with natural sweeteners and whole grains, yoghurt and fruit featuring regularly during the working week. On honeymoon, however, we threw caution to the wind, eating dessert on every single day. Sometimes even twice. Whilst staying in Ubud we ate at Mozaic, a beautiful restaurant run by a chef with Michelin star experience. Local ingredients are fused with those from further afield, and our two sweet courses included soursop sorbet, grapefruit jelly, kaffir lime and turmeric alongside more the more familiar flavours like chocolate, Campari and red wine. Other highlights from the holiday included papaya and mango sorbets and the freshest coconut ice cream with crunchy coconut granola crumbs. A rich fruit soup scattered with scoops of creamy avocado is something I’m keen to recreate at home and the delicately deep fried sesame-crusted cassava we ate one night by the beach was simply out of this world. This post started out as my attempt to recreate a tarte tatin we ate with salted coconut caramel sauce, a dish so delicious I immediately knew I needed to make it myself. However I’ve been playing around with sugars and ratios in the coconut caramel and I’m not 100% happy, so today’s post is something a little more straightforward. Sticky caramel, plenty of spice and the flakiest puff pastry make this rustic dessert the ultimate autumn treat. The recipe below makes one slightly greedy individual serving, although if I can manage it on my own I’m hoping than you can too. If not grab a second spoon and share it with someone you love: it might just taste twice as sweet. 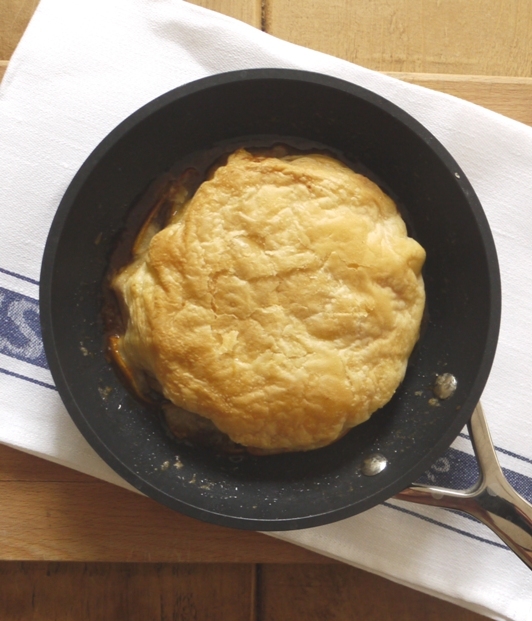 Roll out your puff pastry into a circle slightly bigger in diameter than your frying pan. Place in the fridge to chill while you make the filling. In a small oven-proof frying pan (mine was 5 inches in diameter), heat the sugar until it dissolves and begins to caramelize. Add the butter, cream, star anise and cinnamon to the pan and heat gently until the mixture forms a smooth caramel. Remove and discard the star anise then sprinkle over the fleur de sel. Place the slices of pear over the caramel in any pattern you like, allowing them to overlap slightly. Set the pan aside to cool. Remove the chilled puff pastry from the fridge and drape over the pears and caramel, tucking underneath slightly at the edges. Bake for 25 – 30 minutes or until the pastry is golden brown. Using an oven glove, carefully remove the saucepan from the oven and invert over a plate. 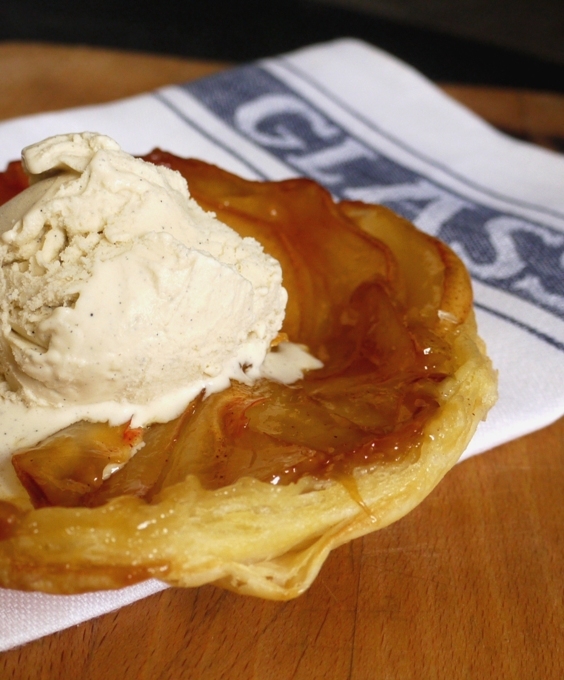 Serve with a large scoop of vanilla ice cream and a spoon to scrape up every last bit of sticky, flaky deliciousness. 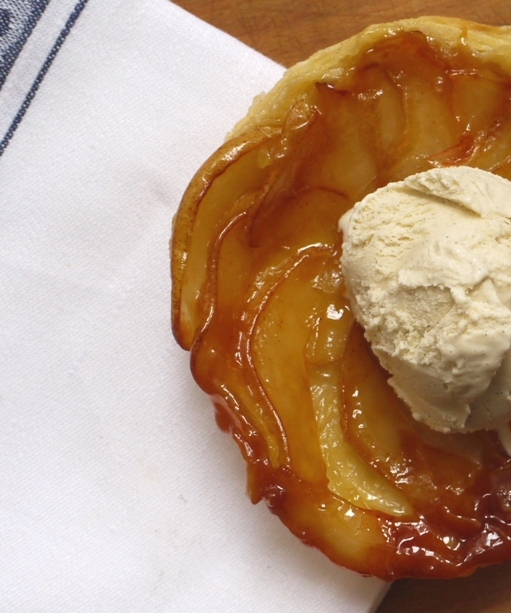 I’ve never seen an individual tarte tatin before – what a beautiful thing! Those pear photographs are just beautiful. What wonderful light! Wonderfully simple tatin. The addition of star anise is very clever. This is a recipe for which I have the pan, the time and the taste. Wasn’t Mozaic wonderful! We went there a couple of years ago and had the best meal, interrupted half way through by a heavy rain storm and a quick dash from our outside table to an indoor one! They are obviously used to this happening as it was all done very efficiently and with no panic! It started raining as we were getting into our taxi to go home and I wondered what would happen to all the restaurant guests! Good to hear they have it covered 🙂 And yes, the meal was absolutely fab, would recommend it to anyone. these look beautifu! Thanks for the step by step images, I’m definitely going to have to try these! I could definitely eat that all on my own. What a great idea – never thought of little individual tatins. Off to experiment. Wonderful – it looks absolutely delicious. Very cute too! Delicious, I love tarte tatin, such a good pud. I find myself making many more puddings now I have children and this is one of my daughters’ absolute favourites. How lovely–a pretty dessert all to myself, and a chance to use the star anise I had to have for some recipe I can’t remember now! I love tarte tatin – my dad used to make it lots when I was growing up (usually an apple version with ice cold whipped creme fraiche on the side) – and I think your spiced pear version is a wonderful idea. I also like that you sliced the pear thinly rather than using halved pears as well – your tarte tatin looks really delicate and neat that way! Definitely nice to have an individual recipe – so I don’t eat an entire tarte tatin! This sounds scrummy – I made a fig and marzipan one last week which was also pretty lush! 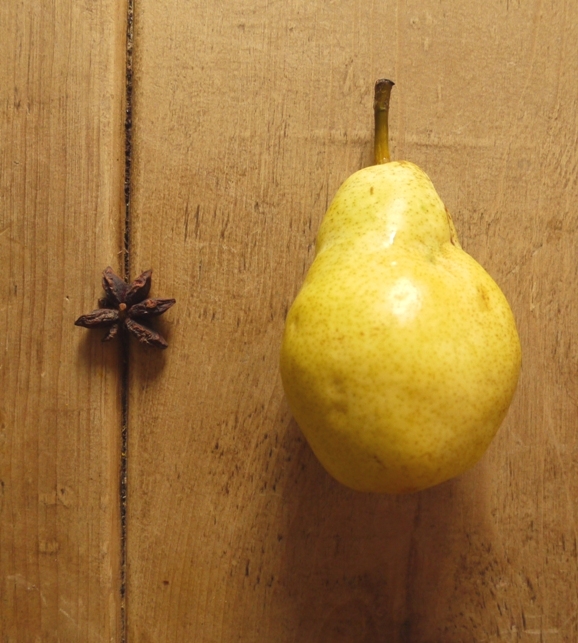 I don’t use pears enough and think that baking them brings out their wonderful flavour even more. I wouldn’t want to share this! 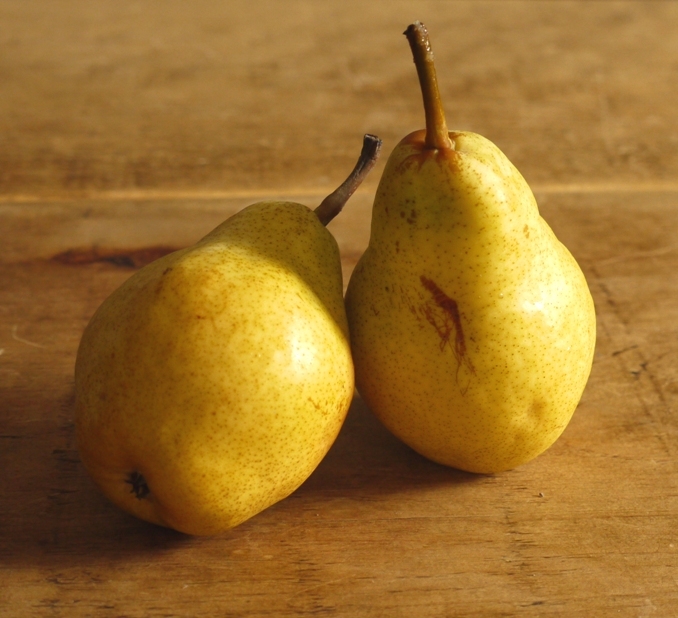 This recipe works really well with slightly underripe pears too – as you say it really brings out the flavour! YUM! I think tarte tatin is perhaps my all time favourite dessert. I’m psyched for the coconut caramel version too. The pears are glistening and beautiful on your tarte tatin. This is just the perfect serving, and I love the spice involved! Thanks Sacha. I love a classic apple tarte tatin too but the pears add a certain special something. This looks absolutely delicous. So clever to make an individual one – so much prettier to serve. I’ve always wanted to try making a tarte tatin so will give this a go! haha loved the “slightly greedy” portion size..also loving the sound of salted coconut caramel sauce – can’t wait until you have perfected that one! In the meantime, your individual pear tart tatin looks just right as we enter the cooler days of early fall. Yum! good luck with the sugar experiments, and this looks delicious as is already! GORGEOUS. I so want to get my tarte tartin on. It’s something I’ve filed in the “intimidating, try later when I get the balls” folder. Maybe I should just go for it. Isn’t it just lovely returning from honeymoon brimming and fizzing with inspirational holiday eats? What delicious food you both enjoyed! Loved this on Instagram (or was it FB?) and still loving it on here. That last close up of the pastry kills me! It’s the perfect way to use up just a little puff pastry…enjoy! Oh yes I’m all for multiple desserts a day while on vacation, that’s one of the best parts! Another beautiful treat! Yum. Bookmarking this as well. Beautiful! I’ve never made puff pastry but I think this is worth a try! The pears. Just, wow.